My favorite kitchen tool broke today. Ok it didn’t break. It leaked. All over the counter. A hairline fracture renders it useless. 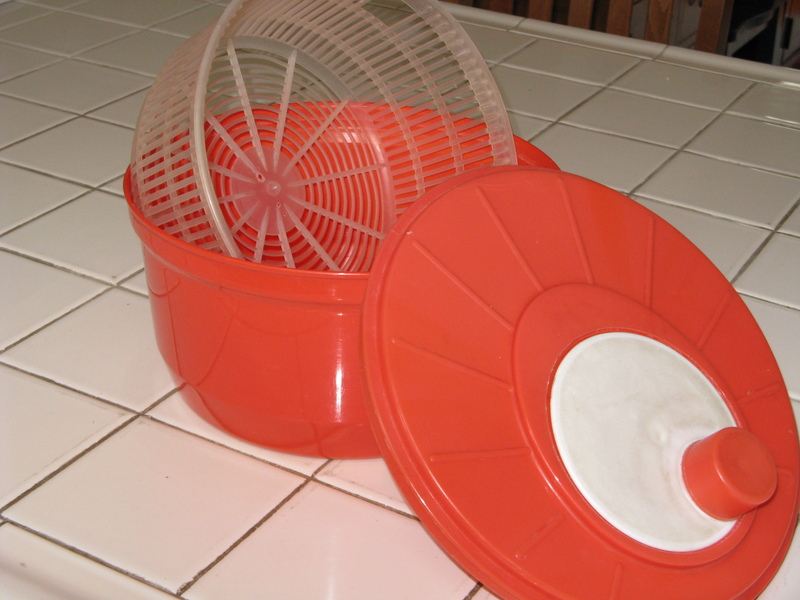 It’s my orange-y red salad spinner. Bought 26 years ago when I first moved to San Francisco. At Rainbow Grocery. The old Rainbow. On the corner of 15th and Mission. Where you paid for your salad spinner separately from your lettuce. I love this salad spinner because of its simplicity. A simple round plastic container surrounds a removable clear plastic interior basket. A lid with a knob. When rotated, the basket spins and the water expels. Centrifugal force in action. Thank you for discovering that principal, Sir Isaac Newton. I’ve even taken it on vacation. This past weekend it lounged around in a condo in Yosemite. In January, it spent a few days at Lake Tahoe, relaxing at a rental house. It works seven days a week. Sometimes twice a day. A replacement must be purchased immediately. But what kind? And will I love it as much? In 1984, there were only a few styles. Now the list of salad spinner features* approaches infinity. If you have a salad spinner that you love and would love to recommend. Write it in the comment section. Otherwise you can find me at Rainbow pestering the workers for a suggestion or left to the mercy of a clerk at William-Sonoma or Macy’s! *Why were engineers working on “improving” salad spinners instead of developing sustainable technology?